Hi Circle Kers! I’m Kate Wong, your NYDCKI District Treasurer for the upcoming service year! I’m currently entering my junior year at NYU, studying Economics. In my free time, I like to play the guitar and practice Tae Kwon Do. This year, I am excited to work closely with all clubs, no matter how large or small, in our District to come up with successful fundraisers for the Governor’s Project, District Project, and club funding. I will be here to assist and connect club treasurers to reach an increase in membership of 20% in each club. I am open to all feedback from all members and officers, please don’t hesitate to contact me throughout the year! March of Dimes marchofdimes.org Every day 1 in 8 babies born in the U.S. arrive too soon. Circle K members help by raising funds annually for March of Dimes programs to help prevent prematurity. The March of Dimes currently focuses on raising awareness of prematurity and reducing the rate of premature births. Our Motto: Live to serve, love to serve! District Project Youth with Disabilities This is a great way to get involved with your local Aktion Clubs! Some other ways to get involved are through: • Walks • Fundraisers • YMCA/PAL • K.E.E.N. Being a part of a newer Circle K club, going to conventions was an experience that stressed me out for a hot minute. Would the friends I had made at previous conventions be there? Would they be meeting up with friends they had met at other conventions and leave me out? But, I should have known better. DCON was just as wonderful as every other convention, and the people were even better. I had the pleasure of being on current District Secretary Julia Dressler's campaign team, and I loved having the opportunity to cheer and support my friend and club president on to victory. The club fair was a huge success, and I had a lot of fun teaching my friends how to make bracelets to donate to a children's hospital. My friends and I jammed out at the dance party, and had an eventful ride home, filled with music and laughs. I was fortunate to have made it to all three conventions this year and I hope to do the same in the upcoming year, as the experience of getting to know people from all over the state has been my favorite part of Circle K. It is always more fun to perform service when the people working next to you are your friends who share the same passion to do good in this world. In doing these conventions, I know that I will have so many people to talk to in the fall at DLSSP. I hope to see my old friends and to make new ones along the way. Here's to the new year! On April 15th, the Iroquois and Southern Tier Divisions held their Regional Training Conference at Syracuse University. Although attendance was low due to Easter weekend, the attendees had a lot of fun. We participated in ice breakers, team building activities, our annual Scavenger Hunt, and officer and member training! Lastly, we talked about division updates, upcoming events and opportunities in New York Circle K. Overall, this divisional was a success. It was a full day of fellowship and leadership. Not only did the attendees learn about their respective positions, but they also spent the whole day getting to know other Circle K’ers from this area. I am excited to see what the 2017-2018 service year has in store for us all! I, along with the rest of CCNY Circle K’s eboard, chose Justin as our May Member of the Month because of his explicit dedication for service. This past service year he served as our club’s vice-president, but he has continuously been a devoted member. He stands as one of the members with the highest amount of service hours. This past service year, he served over 140 hours, as well as over 23 individual hours. He consistently shows his dedication to Circle K by not only taking part in our own events, but by making sure to connect with other clubs and other Circle K members at their events. Many can account for Justin’s passion for fellowship and getting to know others. I can confidently say that Justin brings a certain enthusiasm to Circle K, and I believe anyone would agree. As a rising sophomore, I only joined Circle K this past September and Justin had a huge role in making me feel like a part of our club, whether he was approaching me at events or introducing me to others. In the month of April, he completed a total of 9 hours by attending both of the service events we held- the Hemophilia Spring Event at the Bronx Zoo and Walk MS for the National MS Society. He also attended NYU's Relay for Life event and even volunteered outside of the club by delivering food to the homeless. Word from Key Club Governor Gavin Li Hi Circle K! My name is Gavin Li and I am the New York District Key Club Governor! I hope break is treating y'all well! School is (finally) almost over for us high school students. So a little update from Key Club: our fundraising and service hour goals are $150,000 and 110,000 hours respectively. Just recently, our Key Club Endorsed District Project has also been voted for, the project being Sunrise Day Camp. __________________________________________________________________ Alumni & Kiwanis Family Relations Chair Michelle Feng My name is Michelle Feng and this year I have the opportunity to serve as your Alumni & Kiwanis Family Relations Committee Chair. During this term, we will be executing more Kiwanis Family Relations events throughout the district as well as appointing new committee members to become liaisons for the various branches of the Kiwanis Family. If you are interested in meeting new people throughout the Kiwanis Family or if you simply like event planning, then consider applying! priority as awards chair is to build and strengthen community. The K family is a huge support system whether that be through awards, scholarships, friendships, or anything else. I want to organize my committee in such a way that allows for creativity, especially when it comes to fellowship awards. Also, I hope to encourage increase the number of award and scholarship applications by making the process as seamless as possible. If you agree with anything I have written so far, I hope you will take the time to fill out the application and join the awards committee. 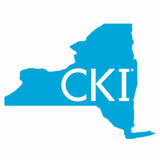 __________________________________________________________________ Club Building and Strengthening Chair Jackie Healy Are you interested with working with people from all over the state to make NY Circle K clubs the best they can be? Well then the Club Building and Strengthening Committee is perfect for you! Hi, my name is Jackie and I'm the committee chair for the "CBS" committee and I'm super excited to work with everyone to enhance the NYCKI district. On this committee we will work together to help build new clubs on campuses that don't have Circle K yet and also strengthen the clubs who need a little help; hence the name building and strengthening. If you are interested in working on helping clubs improve their recruitment and retention; or you have a passion for leadership and want to help develop those skills for others then this committee is perfect for you! Conferences and Conventions Co-Chairs Peony Tse and Sarah Moughal The Conferences and Conventions Committee is CoChaired by Sarah Moughal and Peony Tse! Both are food enthusiasts and are working hard to make every convention as successful as it can be! Sarah is a rising senior studying accounting and art. She is a huge fashion and art history fanatic! She is always upbeat, laughing, and extremely extra! She is looking forward to having lots of fun this service year! Peony is a rising sophomore who loves meeting and interacting with new people. Her goal is to always be a helpful hand to anyone who needs one. She hopes that you will join the committee so that you can take part in making District events fun, engaging, and exciting for everyone! You will gain experience firsthand managing and executing projects. JOIN CON-CON!! Laws and Regulations Chair Tracy Tin Hello! My name is Tracy Tin and I am your current NY District Laws & Regulations Committee Chair for the 20172018 term. I am currently a junior at NYU studying Math Education. To tell you a little bit about myself, I was in Key Club throughout my four years in high school and have been an active member of Circle K International since my freshman year. My goals as the District Laws and Regulations Chair include ensuring that every officer knows what their responsibilities are and have access to their bylaws, making sure that the candidates and delegates know the policies when running for office, and working on potential changes in the regulations of the NY District bylaws to improve and better our instructions and organization. If you are interested in learning and working on what manages and regulates each club and our organization, then this is the right committee for you! __________________________________________________________________ Marketing Co-Chair Edgar Hu Co-Chair Rongfei Jiang There are two co-chairs for the Marketing Committee: Edgar Hu and Rongfei Jiang. Edgar: I am a rising senior at Stony Brook University majoring in psychology & political science. I was past Distinguished Lieutenant Governor for the Long Island Division and the immediate past District Treasurer. I basically stuck around to make sure our district’s marketing is on point. Rongfei: I am a rising junior at Syracuse University studying sociology, women’s and gender studies. I am also president of Syracuse University CKI. Our goals for this committee is to consistently post on our social media platforms promoting district initiatives, district events, and district resources. More importantly, we want to promote what you and your club is doing more this year! 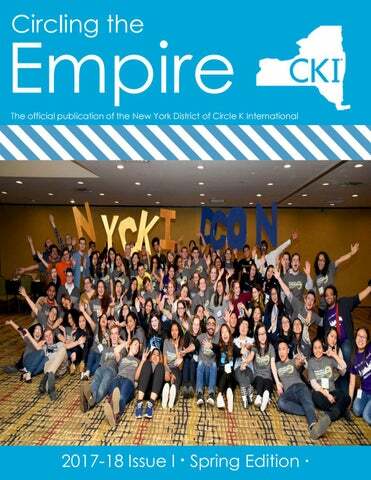 Make sure you follow us on Facebook, Instagram, and Snapchat @nycirclek !!! We also will accept requests for marketing materials in the near future! Hello Everyone! My name is Ryan Coffey, and I am the Service Initiatives Chair for NYCKI! Service is what brings us all together, and is the common bond that unites our organization of passionate members. Our goal for the year is to bring as many service opportunities to you throughout the year, to help grow your club and develop a more active membership. We will also be organizing all of the service activities at our District Conventions, starting off with DLSSP in September! I hope to see you there, and if there is anything you need from me or the committee throughout the year please feel free to ask! Take care, and I hope you have a wonderful summer filled with service!